Billy Williams's much admired swing produced 426 career homers and a .290 batting average. 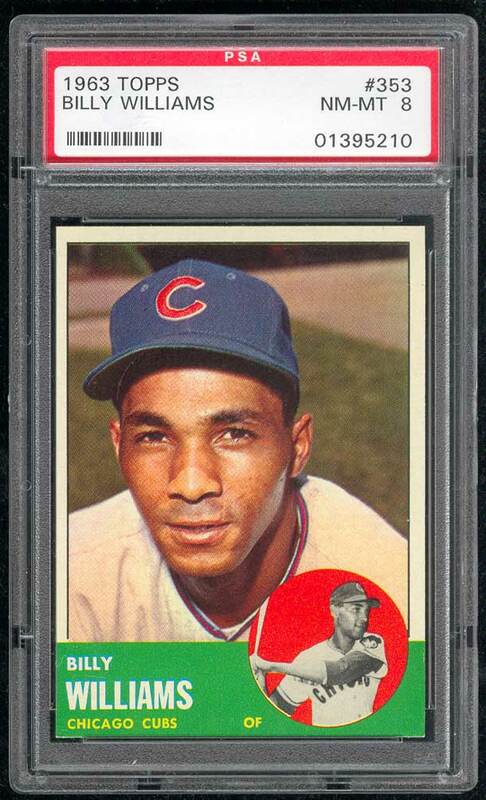 The NL Rookie of the Year in 1961, he had at least 20 home runs and 84 RBI in 13 consecutive seasons. His two best seasons were in 1970 and 1972. 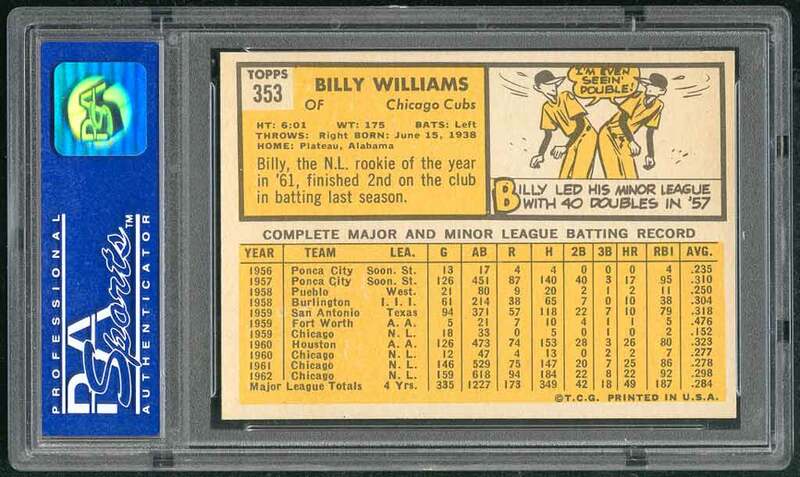 In 1970, Billy hit .322 with 42 homers, a league-best 137 runs scored, and 129 RBI. 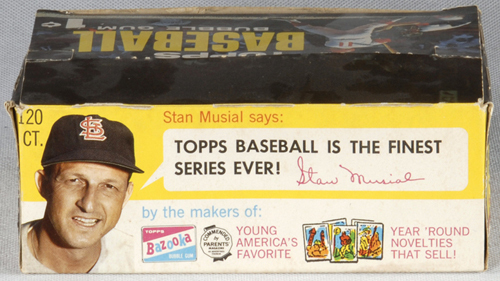 He led the NL with a .333 batting average and a .606 slugging average, with 37 homers and 122 RBI in 1972. 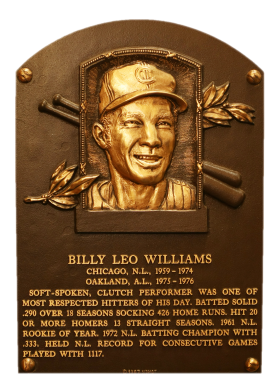 Playing most of his career for the Cubs, between 1963 and 1970 Williams played in an NL-record 1,117 consecutive games. 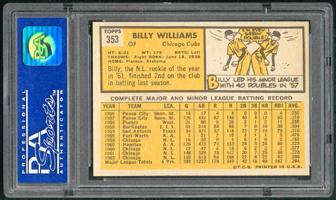 Comments: Rock-solid NM-MT 8 quality on this tough and ever desirable card of the great Billy Williams. Strong corners with the barest hint of wear on the bottom two corners are all that keep this from the MINT grade. I purchased this beautiful card from Shoebox Investments in April, 2000. 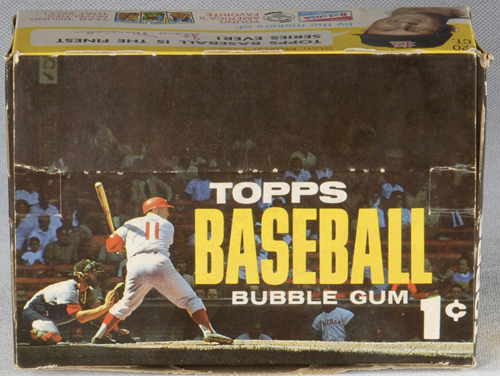 Description: From 1952 to 1965, Topps distributed its baseball cards in 1¢ as well as 5¢ wax packs. (One theory holds that the 1¢ variety was most often deployed in less-affluent neighborhoods, where the more-expensive 5¢ packs were presumed in advance to become slow sellers.) The 1¢ variation's production was a fraction of the 5¢'s, and the 1¢ output in the denomination's final three years (1963-65) was particularly limited; this assumption is confirmed by the general, well-documented rarity of both 1¢ wrappers and empty 1¢ boxes from those years. 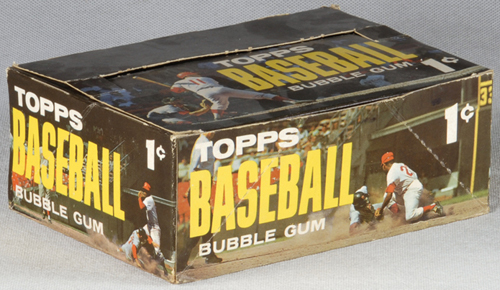 It wasn't until a 1999 Mastro Auctions event that the first example of a 1963 1¢, 120-Count counter-sales box was offered for public sale (fetching nearly $7,000! ).